Àlex, a 14-year-old boy, runs away from home when he finds out that his father wants to sell an old theater that has been in the family for several generations. He hides in the now abandoned theater and there he fi nds some old masks. When he puts one on his face, everything around him disappears and he is transported to a parallel world. 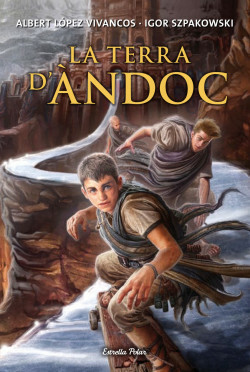 When he arrives to this place called Àndoc, he meets Aram, a boy his age, who explains to him that he has been chosen to carry out an important mission: free Àndoc from a terribly evil being, the titan Ertús. In order to destroy Ertús the titan, Àlex, who has taken the name Ingvar in this new world, can count on the assistance of most of the inhabitants of the Worlds of Àndoc. They will do all they can to help him fi nd the magic words spoken by the great Gahamaranan Xertzak before he disappeared underground, for only with those words can Ertús be destroyed. An adventure story about friendship, self-improvement and perseverance where anything you can imagine can become reality.